If we had wanted a brown lawn, we could have sodded a lawn with the dead blocks of grass brought to Milberger's last weekend for analysis during the KLUP-930 AM radio program! Either aliens with small, round ships had landed in most folk's lawns killing spots in the lawn or we have a serious problem. We decided that the two main culprits in this spontaneous ugliness were drought and diseases. He writes: "Many lawns have brown dead looking areas. There are many causes of the brown areas and in order to green the problem areas, you must diagnose the cause. The brown areas usually are caused by drought, brown patch, take-all-patch, chinch bugs or grubs. Drought is addressed with infrequent deep watering. Brown patch is a fungus disease favored by excessive and/or too frequent irrigation, too much nitrogen fertilizer. Brown patch can be managed by watering less frequently, reducing nitrogen fertilizer, and applying a fungicide. 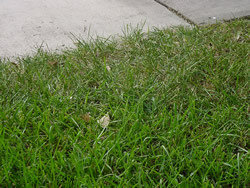 Take-all-patch is a fungus disease that is managed by acidification (with sphagnum peat moss, acidifying sulfur treatments), aerating compacted soils, providing surface drainage, deep infrequent irrigation, correcting iron and zinc deficiencies (based on recent work by Roger Havlak), and using a vigorous turf variety. Both chinch bugs and grubs are killed by application of a soil insecticide." To further refine this analysis, I will state that shallow soil is not a good growing medium for turf grass. Most St. Augustine planted on shallow soil and watered less than once a week with a application of at least one inch of water WILL TURN BROWN from lack of moisture. The exception is Floratam which is the most drought tolerant of all St. Augustinegrass. Also, brown spots near sidewalks or pavement are caused by drying-even if you have an automatic sprinkler system. The water from such systems are directed away from the sprinkler so the area immediately under and slightly behind the system dries and dies. Also, it is very difficult to apply enough water to the lawn in the hottest section of the lawn which has the shallowest soil when we have a spell of 100º F days with no rain. The dead areas are usually linear rather than round and almost always are in full sun. 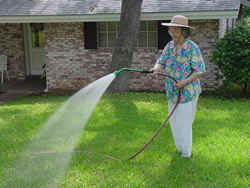 The areas can also be a spot in the lawn where the irrigation application of water is not even. What you "should have done" was to hand water the spots several times per week-but as Tanya Tucker sings: "It's a little too late to do the right thing now!". Some hand watering can prevent brown spots during periods of drought. Brown patch disease caused by Rhizoctonia solani fungus is not too prevalent now because the weather is dry and hot - it is more likely to occur in spring and autumn. Brown patch fungus usually attacks the base of the blade but seldom kills stems and roots. The pattern is a near-circular rounded brown area with an expanding edge. Classic spots are shaped like a donut. The green hole in the center is formed by green blades that are re-emerging as the grass recovers at the center of the infection. Because some people water like maniacs (three times a week!!) during hot, dry weather, we have actually seen brown patch in the summer. Lawns at the bottom of the slope or lawns with high N fertilizer that are over watered are the most likely to have brown patch. Brown patch fungus is why we recommend that homeowners water less and only water in the morning in the autumn. Labeled fungicides such as Turfcide 10G and Hi-Yield Lawn Fungicide Granules with terrachlor or PCNB; Greenlight Fung-Away Systemic Granules with thiophanate-methyl, Ortho Lawn Disease Control and Ferti-lome Systemic Fungicide with propiconazole and Sprectracide Immunox with myclobutanil will help stop the brown patch fungus. Basically, apply one-half inch of sphagnum peat moss over the dead area to encourage recovery of the area. The sphagnum peat is acid, which disfavors the fungus. "These products contains myclobutanil which is one of the fungicides listed as having activity on Take-All Root Rot. I believe it is as good as the other products labeled for use on Take-All. As to which is best, peat moss or fungicide, I really can't say. In some cases the peat moss seems to work better and then in other cases one of the fungicides seems to work better. At $16.95 per 8 pound bag, this is very expensive. If you apply two applications in the fall and two in the spring, that is over $68 per 1,000 square feet. You can sod cheaper than that." It is the most drought tolerant of ALL the St. Augustines, it is chinch bug resistant and it is tolerant (does not show pronounced symptoms) of Brown Patch or Take-All Patch. With this said, those of you who have suffered the brown-spots-in-the-lawn phenomenon this summer should follow this advice. Rent a lawn de-thatching machine, cut and remove the dead grass areas, and re-sod with Floratam St. Augustinegrass. Problems solved. Then next summer when we get into a dry spell, watch for the rounding blades in the morning on the Floratam-then water thoroughly for at least an hour. This is a testimonial-I have had Floratam St. Augustinegrass in my front yard for over 25 years-through the 6 degree F. temperatures of 1983 and the 12 degree F. temperatures of 1989-and never lost the stand AND NEVER had a brown patch circle in the yard. When grass is rolled rather than flat in the morning water thoroughly immediately. One more point of interest, the ONLY organic solution which is effective on lawn diseases is the sphagnum peat for Take-All Patch. Sphagnum peat is not effective against Brown Patch. Lately there have been claims made that corn meal and a garlic extract is effective. This is absolutely false! even if these purveyors claim that a University tested and/or recommended the product. Everyone trying to do the "environmentally friendly-to-a-fault" thing have been wasting their money. They would have been better off making corn bread and using their garlic for cooking purposes! Let me explain how these University tests and recommendations have been misrepresented in a desperate attempt to find an organic fungicide. The corn meal was investigated by a Texas A&M pathologist as a way to produce parasitic fungi used to control a fungus which occurs on peanuts if not planted in a crop rotation with corn. This is a very specific and very unusual parasitic fungi relationship which DOES NOT translate as a control for every other fungus on earth! The same "leap of knowledge" was used years ago when it was found that a sugar concentration in a solution would kill soil nematodes in a test tube because of osmotic pressure differentiation. The resulting organic nematode control was to add sugar to the soil! The old test tube and petri dish has also generated another massive outlay of misinformation about garlic extract. Another University did some studies in petri dishes exposing several soil pathogenic fungi types to garlic extract as well as THE EVIL PETRO-CHEMICAL products currently being used. GOOD NEWS!!!!!!!! The garlic extract was as good if not better than the chemical products. I imagine salt would have also been effective-in fact, I know it would. Years ago Texas A&M stated in a publication that the addition of salt to a soil would reduce the occurrence of cotton root rot fungus. Who could tell? The plants wouldn't grow in the salty soil anyway!!! I consulted Dr. Larry Barnes, Texas A&M pathologist about this University test on garlic extract. He indicated that the petri dish test is only an indicator of what might work in the soil and the petri dish test alone SHOULD NEVER BE USED as a positive indicator of effectiveness of a product. Do you wonder why further testing in field conditions have not been performed? Because the product distributors do not want to take the chance of failure. So if you want to waste money on a "snake-oil" product that hasn't ever been statistically shown to be effective in field conditions just for the sake of organics, step up to the counter-they will be more than glad to take your money! Safe, abundant, high quality food is the rule rather than the exception in America. It's a standard which consumers demand. Food producers rely on a variety of agricultural technologies to ensure that America's dietary needs remain affordable, nutritious and readily available on grocery store shelves. One of these agricultural advances, which has helped make U.S. consumers and growers the envy of the world community, is a family of agricultural chemicals known as fungicides. Fungicides are chemicals which shield crops and foods from fungus. They perform as "medicines" for plants. Fungal diseases, if left unchecked, rob crop yields and cause rapid spoilage of fresh produce. *Fungicides help growers provide top quality food and feed grains to U.S. consumers and the world. *Fungicides provide consumers with fruits and vegetables at the peak of freshness and nutrition. *Fungicides enable importation of a variety of fresh produce which is unavailable or in limited supply from U.S. growers, such as bananas. *Fungicides help U.S. producers provide wheat, corn and other grains to food-needy nations. *Fungicides help maintain America's pre-eminent position as an efficient producer of food and fiber for domestic and foreign consumption. Some fungicides are applied as a seed treatment, effectively defending the germinating seed from infection. Virtually all seeds for U.S. corn and wheat crops and nearly one-third of soybeans are treated in this manner. Other fungicides are applied to the growing crop to protect the leaves and fruit. Still others are used to guard against fungal-borne decay during shipping and storage of harvested crops. Fungal disease, unlike many human ailments, is not curable after detection. Crops are constantly threatened by a variety of fungal organisms. If left unprotected, crops can be ruined, harvests devastated. Hence, the recommendation made when tomato plants have set an abundance of marble-sized fruit, to begin a preventative, prophylactic fungicide spray every 7 days with a product containing chlorothanol such as Daconil. This application such be judicially applied during periods of wet (rain or heavy morning dews) weather. Once the symptoms (plant foliage yellowing and dying from the bottom of the plant upward) begin, leaf surface, and consequently plant production, has been damaged. What would happen if growers stopped using fungicides? Recently, a noted Washington, D.C., economics firm explored this question in detail. Its authoritative report found broad implications of restricting fungicide use. -and wipe out nearly a quarter million on-farm jobs with negative ripple effects among rural community businesses. Imagine an America where fruits and vegetables were constantly in short supply...an America where fresh produce was so scarce that higher prices made them unaffordable to the average consumer. Unimaginable? Such a situation could exist if fungicide use was halted. Fruit and vegetable supplies would drop by 24 percent. With the help of fungicides, America's growers have been able to nearly double apple and peach production and increase by one-third supplies of strawberries, grapes and tomatoes. The consumer benefit: greater selection, lower cost, less need for imported produce. Fungicides also are responsible for safeguarding our nation's almond and peanut crops. Otherwise, production of these two crops would be nearly non-existent. Yields for everything from potatoes and carrots to lettuce and onions would plummet in the absence of a guard against a wide variety of fungal disease. Many imported products such as bananas and other tropical crops which are dependent on fungicides for production would be either unavailable or so expensive as to be luxury purchases for most consumers. By sustaining production, fungicides help hold down food costs. The price tag for apples and carrots would nearly double without fungicide use, while the cost for potatoes, peaches and tomatoes would climb by more than 36 percent. Consumers would pay substantially higher prices for lettuce, beans, strawberries and grapes. Almond prices would jump more than 136 percent, and peanut prices would rise 68 percent. Fungicides help maintain a variety of healthful food choices. Fruits and vegetables are more than just good for you. Studies and recommendations, such as those by the National Research Council, National Academy of Sciences, show that diets emphasizing fruits and vegetables can significantly reduce the risk of coronary disease and some types of cancer. In the absence of fungicide use, many Americans would be forced to turn away from or limit their consumption of fresh fruits and vegetables because of higher price tags, limited supply and lower quality produce. Low-income consumers would be especially impacted -- both economically and from a health-risk perspective. Also worth noting is that many crops grown without fungicides tend to produce greater amounts of natural toxins produced by uncontrolled invading fungi, or infected produce. In high concentrations, these toxins can raise more serious health-related questions which override the risks of fungicide residues. We are fortunate to live in a nation where food is plentiful. Indeed, the United States continues to set the global standard for food safety, afford ability and nutrition. U. S. growers backed by proven technologies such as fungicides, and guided by consumer needs for healthful diets sustain the reality and fulfill the promise of safe, abundant and nutritious food for generations to come.